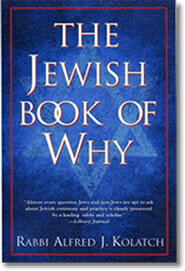 If you have ever wondered why Jews celebrate a particular holiday or observe a specific ritual or custom, The Jewish Book of Why will surely provide the answer. Since its initial publication in 1981, this best-selling volume has been an essential resource for Jews seeking to better understand their own heritage and for non-Jews desirous of understanding the lifestyle of their neighbors. In this new edition of a now-classic work, Rabbi Alfred J. Kolatch presents hundreds of questions frequently asked about Jewish belief and practice and provides answers that are concise, clear, and straightforward. Whether discussing the celebration of life's joyous milestone events, the definition of Jewish identity, conversion from another faith, death and mourning practices and procedures, synagogue ritual, or the rationale behind the kosher dietary laws, he presents the range of views held by the major Jewish denominations: Orthodox, Conservative, Reform, and Reconstructionist. The information is presented simply and objectively, replacing confusion and misconception with knowledge and understanding. Enhanced by an index that makes the information readily accessible, The Jewish Book of Why is authoritative, enlightening, and indispensable. "Ready answers to a wide spectrum of questions." Alfred J. Kolatch, a graduate of the Teachers' Institute of Yeshiva University and its College of Liberal Arts, was ordained by the Jewish Theological Seminary of America, which subsequently awarded him the Doctor of Divinity degree, honoris causa. From 1941 to 1948 he served as rabbi of congregations in Columbia, South Carolina, and Kew Gardens, New York, and as a chaplain in the United States Army. Rabbi Kolatch authored more than fifty books, the most popular of which are The Jewish Book of Why and The Second Jewish Book of Why, The Jewish Book of Why: The Torah, The Jewish Mourner's Book of Why, Inside Judaism, A Handbook for the Jewish Home, The New Name Dictionary, The Comprehensive Dictionary of English and Hebrew First Names, The Family Seder, and The Jewish Child's First Book of Why. Among his other notable works are Great Jewish Quotations: By Jews and About Jews, The Presidents of the United States & the Jews (with David Dalin), What Jews Say About God, and Masters of the Talmud: Their Lives and Views. In addition to his scholarly work, Rabbi Kolatch served as president of the Association of Jewish Chaplains of the Armed Forces and as vice-president of the interdenominational Military Chaplains Association of the United States. Â© 2016 JDBooks.com. All rights reserved.